Once a leader on climate action, Australia is now lagging behind its major allies and trading partners, says The Climate Council of Australia research manager Martin Rice. Climate change, now belatedly added to the agenda for this month’s G20 meeting in Brisbane, is a perennial topic whenever leaders gather for international summits. That’s understandable, given that countries tend to have one eye on what others are doing to cut emissions. But host nation Australia, once one of the leaders on carbon policy, is now lagging behind the pack. The top dogs – China, the United States and the European Union – are tackling climate change, and in the process they’re leaving Australia looking like a pup, according to the latest Climate Council report. In the past 12 months China and the United States (the world’s largest greenhouse emitters) have stepped up their efforts to tackle climate change. Meanwhile, the European Union’s 28 nations (including some of the world’s largest economies) has almost achieved its 2020 target for reducing emissions and has recently pledged to cut emissions by 40 per cent by 2030, as well as setting ambitious targets for renewable energy. 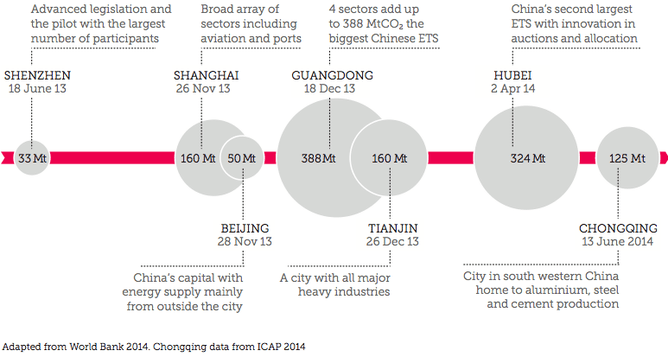 China recently introduced seven emissions trading schemes, in five cities (Beijing, Tianjin, Chongqing, Shanghai and Shenzhen) and two provinces (Hubei and Guangdong), which together are home to a quarter of a billion people. 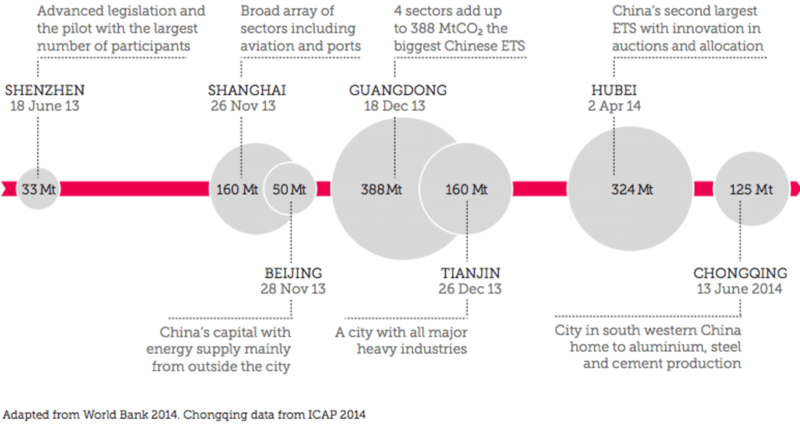 Collectively, China’s emissions trading schemes cover emissions equivalent to 1.1 billion tonnes of carbon dioxide, making this the second-largest carbon market in the world, after the EU scheme (2.1 billion tonnes). In September 2013, China introduced a new Action Plan for Air Pollution Prevention and Control to reduce air pollution from fossil fuels and limit the proportion of coal in China’s energy mix to 55 per cent by 2040. In 2013, for the first time, China installed more renewable energy capacity than fossil fuel or nuclear. In 2013, China invested US$56.3 billion (A$65.7 billion) in renewable energy – more than all of Europe combined – and now is home to 24 per cent of the world’s renewable energy capacity. As befits the world’s biggest nation, China is now number one in installed renewable energy capacity, new installations, and investment. Similarly, there have been positive developments by another global energy giant, the United States. In 2014, it announced measures to cut pollution from coal power plants by 30 per cent. It is also on track to meet its international commitment to reduce emissions by 17 per cent below 2005 levels by 2020. The US submission to the United Nations Framework Convention on Climate Change set out an indicative pathway to a 30 per cent in emissions in 2025 and a 42 per cent reduction by 2030, in line with the goal to reduce emissions 83 per cent by 2050. Vehicle emissions standards introduced nationally in 2011 are projected to cut US emissions by the equivalent of 6 billion tonnes of carbon dioxide by 2025 – the same as removing more than 85 million cars from the road. 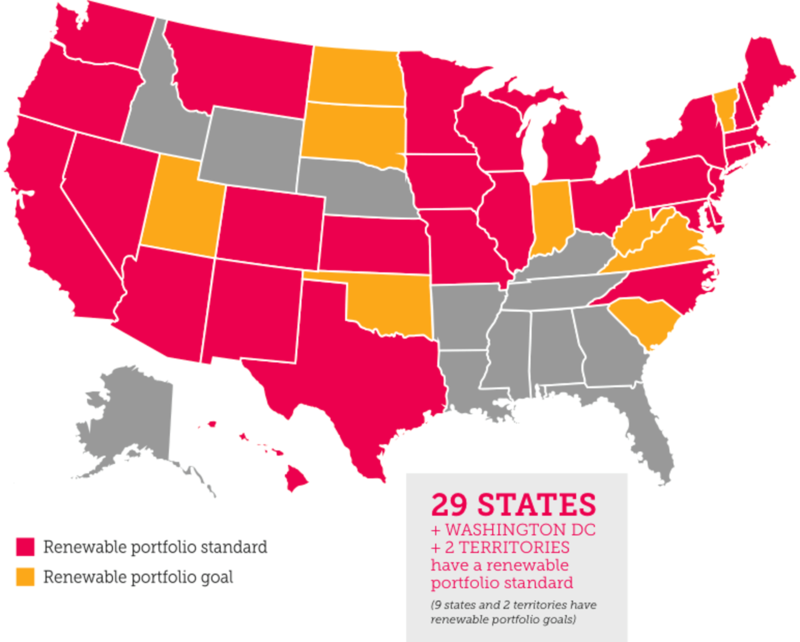 More than half of US states have renewable energy targets, and the United States is second in the world for installed renewable energy, which provided 12.9 per cent of its electricity in 2013. Ten states – with a combined population of 79 million – are involved in emissions trading schemes. Nine of them are members of the Regional Greenhouse Gas Initiative, while the tenth, California (which would be the ninth biggest economy in the world if it were independent), has been running its own multi-sector cap-and-trade program since 2013. As of 2012, the EU had cut its emissions by 19.2 per cent relative to 1990 levels, putting its 2020 target of 20 per cent well within reach. Emissions per capita have fallen dramatically, from 9.1 tonnes per person in 1990 to 6.8 tonnes in 2013. The EU is now looking to redouble its efforts beyond 2020, with the EU Commission launching a new framework in January 2014 to set out even more ambitious 2030 targets for reducing emissions and increasing renewable energy. Renewable energy now provides 23.5 per cent of the EU’s electricity needs. Global momentum is building on action on climate change. As in the world’s biggest polluters, the most common types of action include carbon pricing, reducing pollution from coal-fired power plants, and investing in renewable energy. The number of countries and sub-national jurisdictions putting a price on carbon continues to increase: 39 countries are putting a price on carbon – up from 35 in 2013. A further 26 countries are currently considering introducing carbon pricing. Worldwide, the number of countries with policies supporting renewable energy also continues to increase. In early 2014, 144 countries had renewable energy targets and 138 had renewable energy support policies in place (up from 138 and 127, respectively, in the previous year). Global efforts to drive down emissions will take time to impact on the overall global trajectory. Despite the positive progress, global greenhouse gas emissions continue to increase and Earth continues to warm: 2013 was the 37th year in a row of above-average global temperature. In Australia heatwaves have already become more extreme, more frequent and longer-lasting, while bushfire conditions in many areas have worsened. The potential impacts on our nation are clear. Once a leader on climate action, Australia is now lagging behind its major allies and trading partners. Recent uncertainty over the Renewable Energy Target has resulted in a 70 per cent drop in investment in renewable energy in 2014 compared with last year. And any emission reductions achieved over the past few years in Australia’s electricity sector have effectively been cancelled out since the repeal of the carbon pricing mechanism. Since the carbon price repeal, National Electricity Market emissions were up 4 million tonnes on the equivalent period last financial year. This increase in emissions corresponds with a growth in the share of coal in electricity generation, up from 69.6 per cent in July 2014 to 76.4 per cent in October 2014, while output from hydro power has dropped. Just this week the Intergovernmental Panel on Climate Change has reminded us that deep cuts in emissions are needed if we are to keep global warming within 2C this century. The international community will have an opportunity to get serious about climate change at the UN Climate Summit in Paris in December 2015. Before that, of course, is this month’s G20 Summit. Host nation Australia has a duty to contribute to global efforts to tackle climate change, but at the moment it’s not at the races and is no longer a top dog. Martin Rice is the Research Manager of the Climate Council, an independent non-profit organisation. This article was originally published on The Conversation.